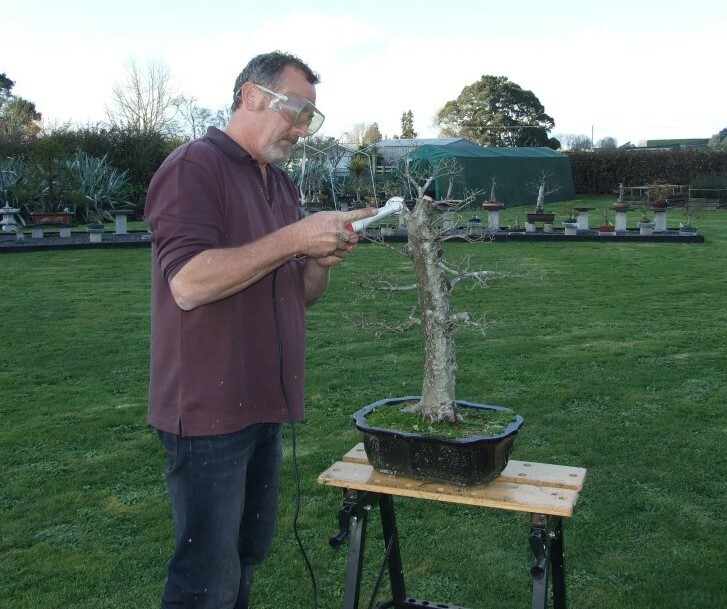 Peter’s plan to get on with cutting all the hedges took a set back – the hedge cutter attachment broke a drive shaft meaning it had to go in for repair at the start of a nice weekend. At least it was only $50 for the repair – rather than $500 for a new hedge trimmer. 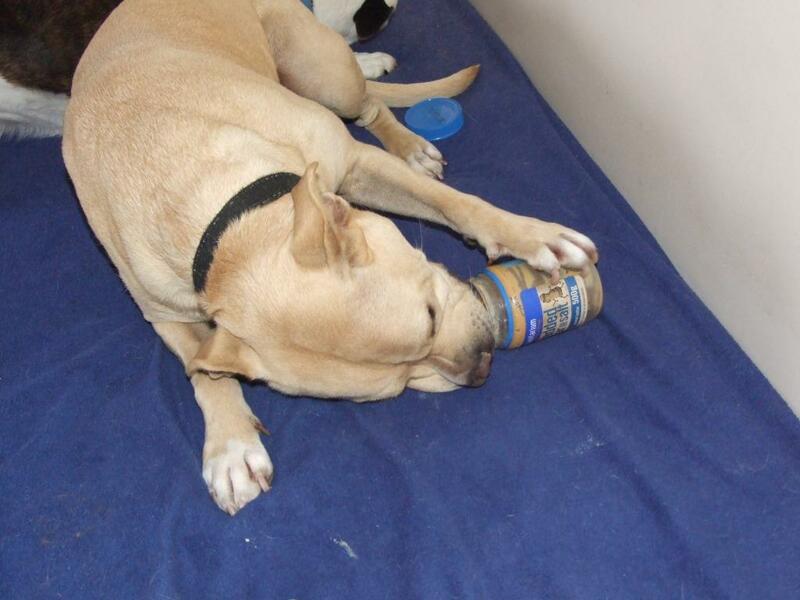 The girls enjoyed cleaning out a couple of empty peanut butter jars, however when Ann got home from work that evening there were signs of an ‘upchucking’ episode (smell and a gunky patch on the dog bed). 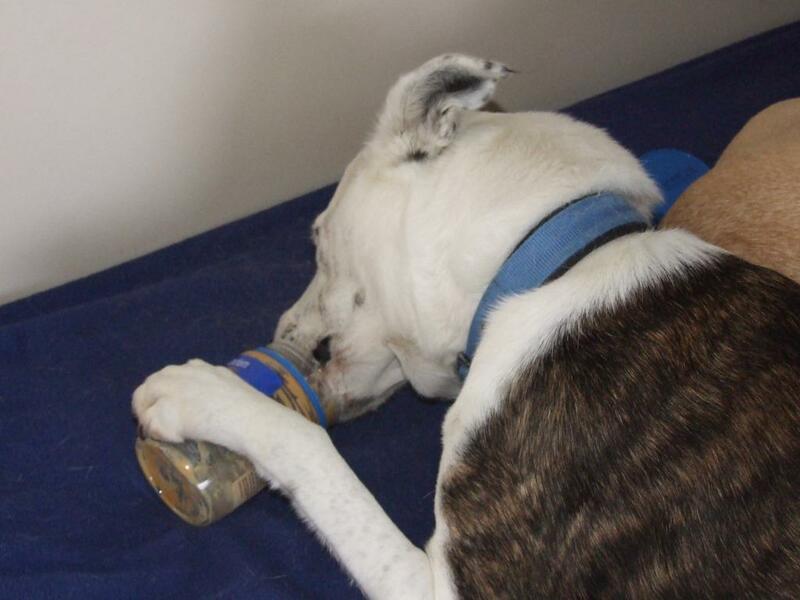 Neither dog has confessed to the vomiting or the ‘cleaning’ up – double yuk! We had a fun hour in Browsers, the local second hand bookshop in Hamilton, spending some of our gift voucher from Lyn and Duncan. We got about 25 books between us. Need to return there sometime to use up the rest of the voucher. 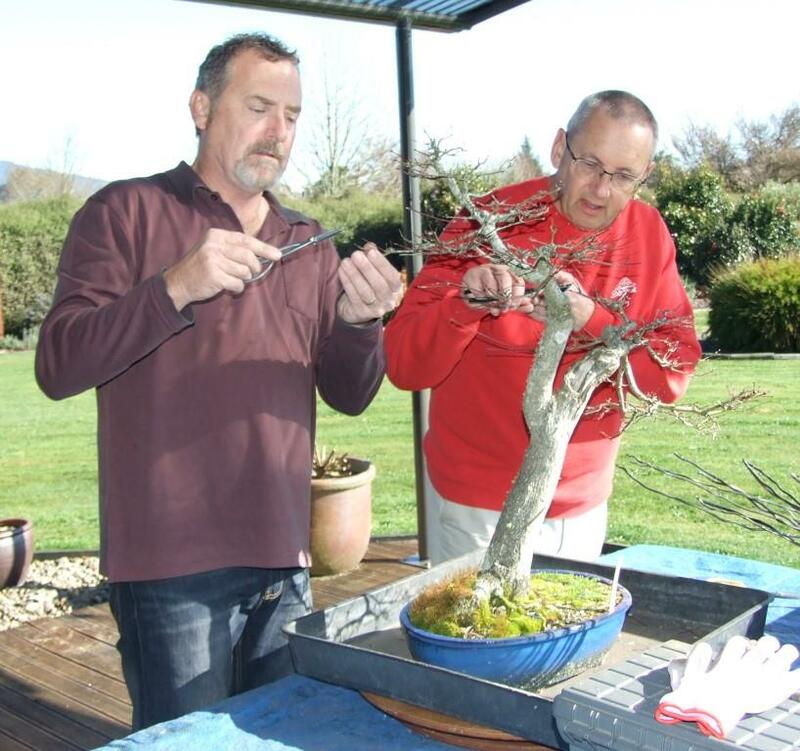 We had another trip to Fern Valley Bonsai in Tauranga to dig up a juniper we saw when we were there last time. We also collected a large celtis (Chinese hackberry) for Ann. 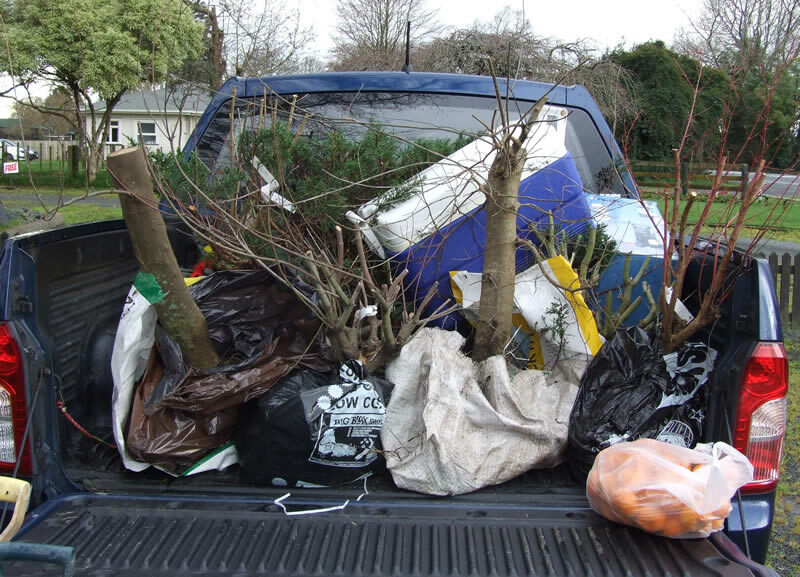 Three of our friends from the bonsai club came with us and they collected another 5 trees. The Ute was rather full on our return home. 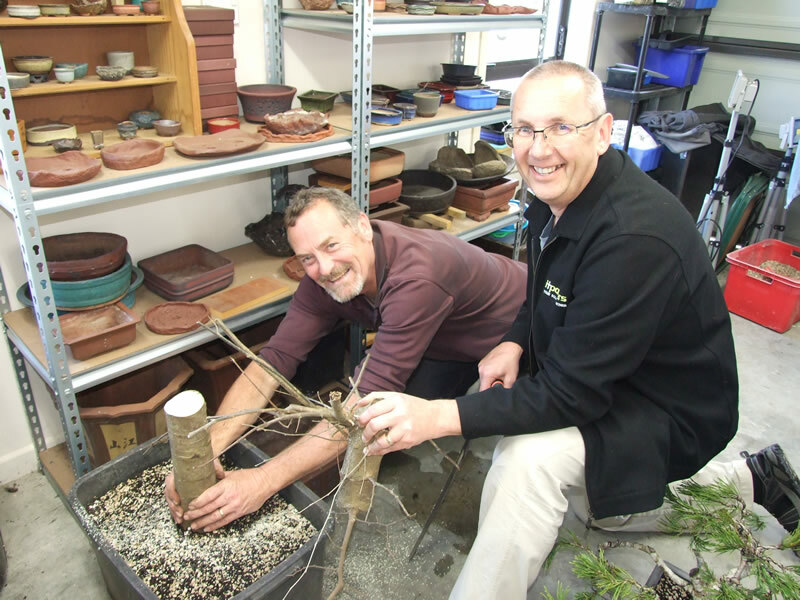 We had a day of working on our bonsai trees with our favourite Australian. 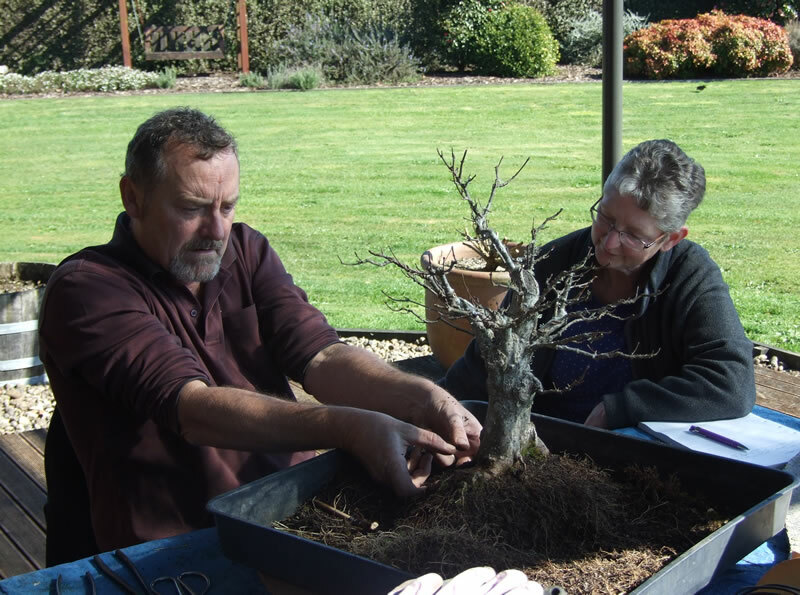 Tony stopped with us for a few days whilst he was over here running workshops and we managed to get his professional advice on a number of our trees. 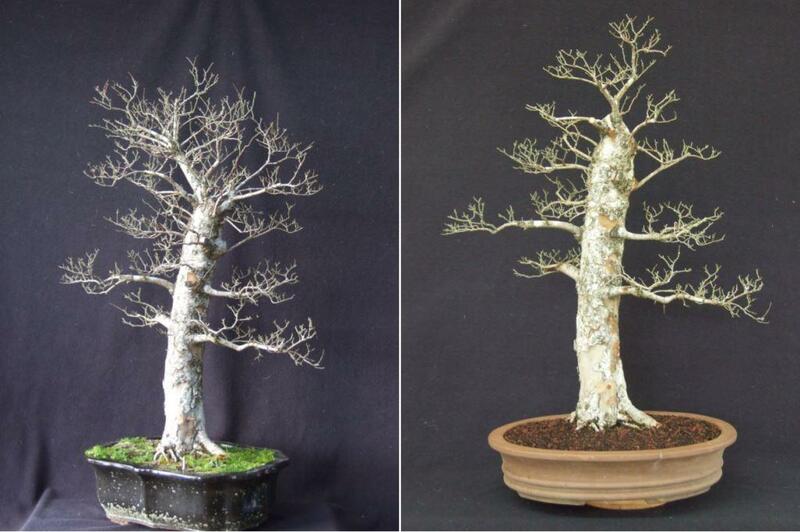 Ann’s Chinese elm – before and after. It’ll look great when it’s in leaf. 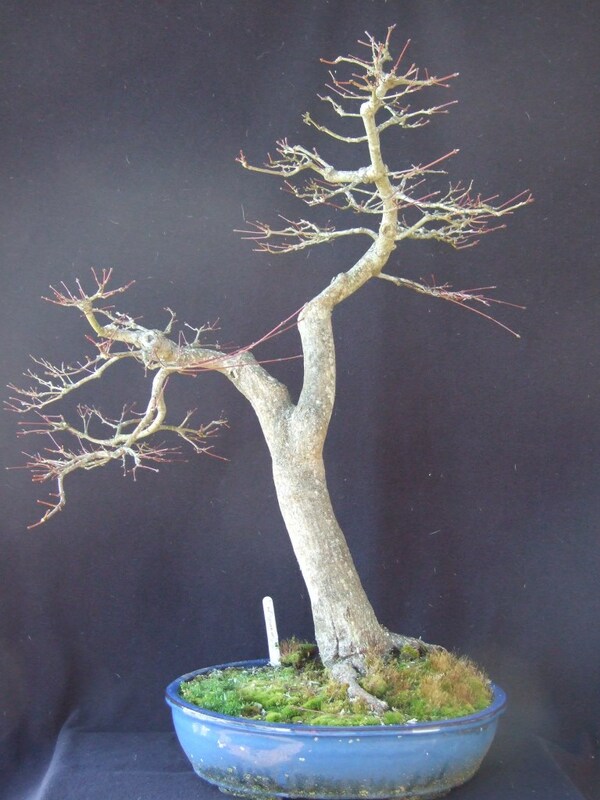 Remember that celtis that Ann got (a couple of photos up)? 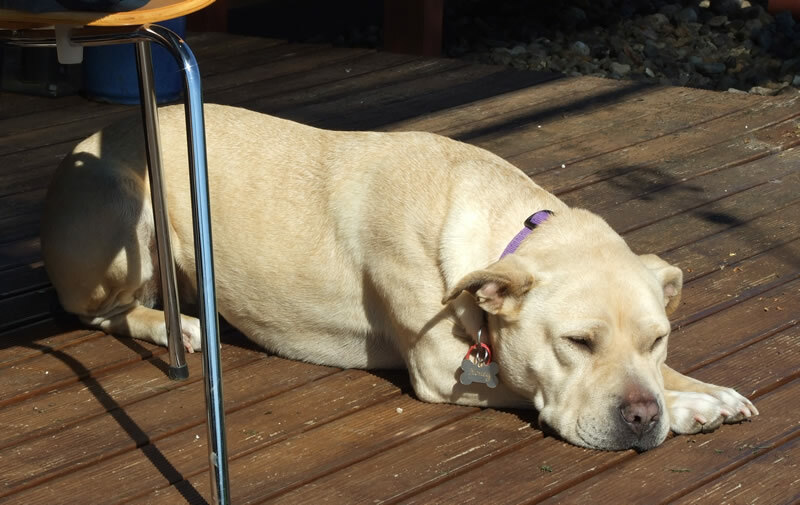 Well – Tony said it was too tall so Peter got the saw and ………..
As it was a nice sunny day Maxie spent the day sunbathing on the deck. 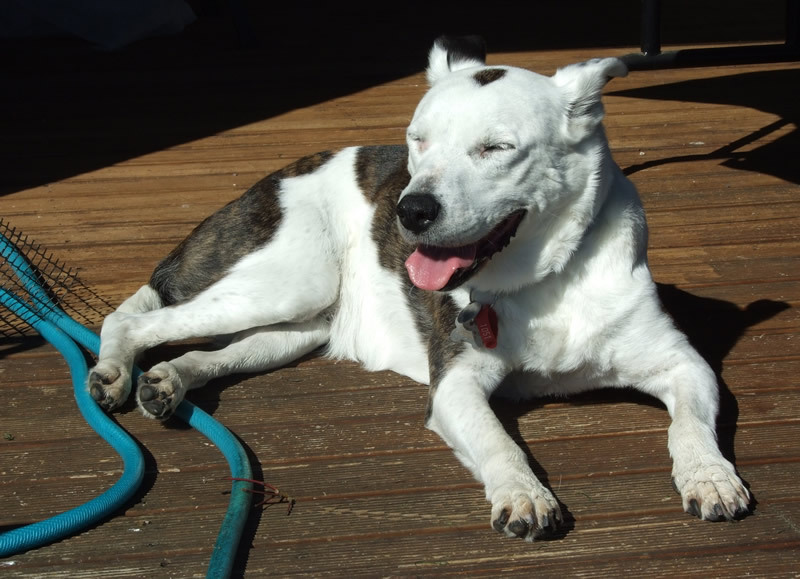 Honey also enjoyed the sun – until Tony got the power tools out. We ended the month by celebrating our 26th Wedding Anniversary. 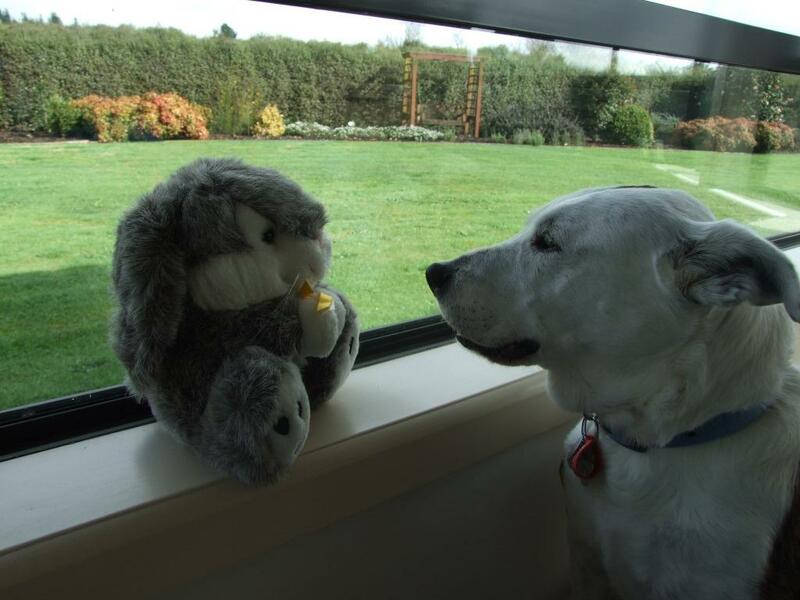 Ann got beautifully wrapped gifts – books, chocolate and the latest addition to the rabbit collection – Kowhai. 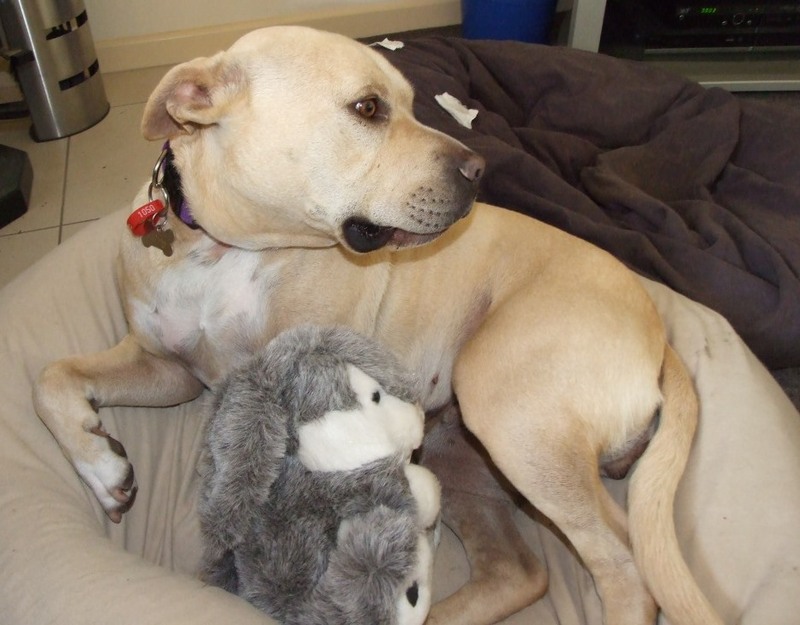 Maxie was happy to say hello but Honey wasn’t so sure about a furry thing invading her bean bag! 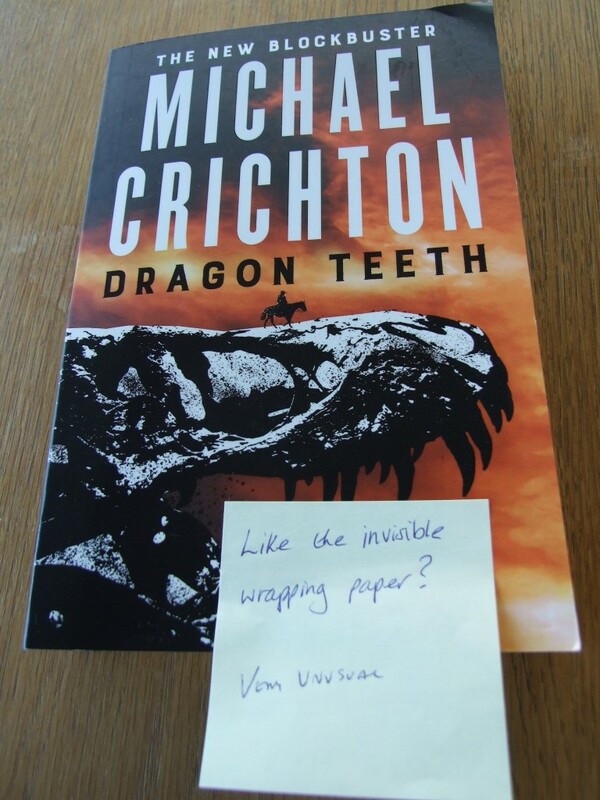 Peter was lucky to get a single book – with special invisible wrapping paper! 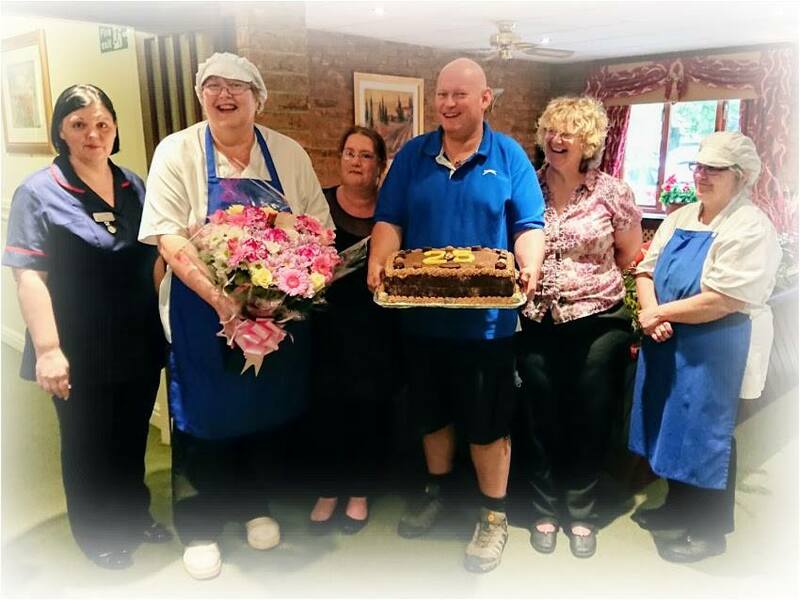 Ann’s sister in law, Carol, (now head chef) celebrated 25 years working at Cedar Falls Retirement Home, Spalding.